The Department of Foreign Affairs issued Department Order No. 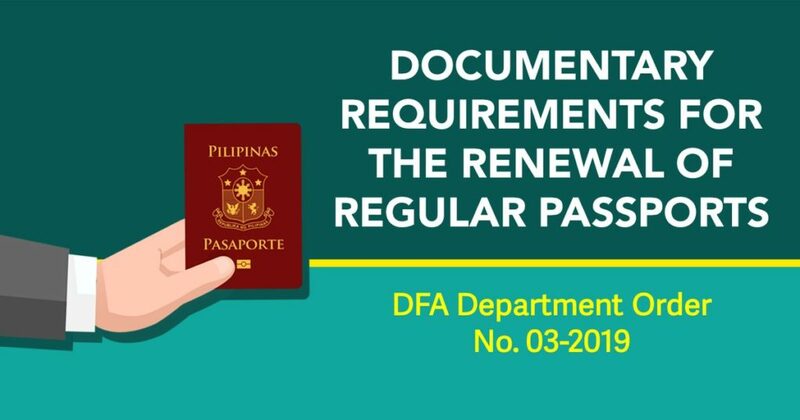 03-2019 on January 15, 2019, removing the requirement of the submission of a birth certificate for passport renewals except in a few specific cases. Exemptions are first-time passport applications, renewal applications for lost and mutilated passports, renewal applications requiring changes in the passport entries, renewal applications of old brown and green passports bearing no complete middle name, and those who are in the Department’s watchlist. The DFA said that they issued the order in line with the President’s directive for a streamlined government frontline service, and in compliance with Republic Act No. 11032, or The Ease of Doing Business Act. Philippine Foreign Service Posts and Consular Offices have been instructed to immediately implement said Department Order.